Women’s month and the Rover Centenary provide the perfect platform to shed some light on some of the amazing female Rovers in our Movement. One such woman is Carmen Jearey who hails from Durban and is currently the RAC chair. Carmen’s Scouting adventure started when she was a Cub. She stayed there for a few months before she moved up to the Troop. “I achieved my Springbok award as well as my Bushman’s Thong during that time”, she says proudly. 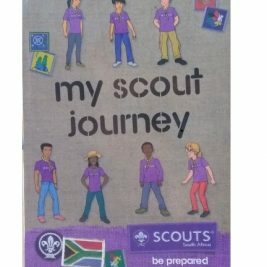 “I did not want to miss the adventure Scouts provided me so it was a very natural step for me to move on to Rovers”, she explains. “I also had a group of friends doing the same, so I never even had to think about moving up to Rovers, I just did it! The Rover advancement system was very beneficial to me as it helped me find out what I wanted to do and who I wanted to be as a person.” she says with a smile. “Rovering is much like Scouting. It brings people together and gives you the chance to make many new friends”, she states. Carmen will always advocate Rovers because of what it stands for in its mission and its aims. “Rovers provide the best “rules” to live by to ensure you will become a good person. I am passionate about Rovers because it helps you in all areas of your life”, she adds. Carmen, who works in the imports industry after she finished her degree in Business Administration, loves exploring Durban and making the most out of its wonderful weather. She is currently the Chairperson of the SIGMA Crew and the RAC (Regional Advisory Council). “I have thoroughly enjoyed getting everyone together and helping shape Rovers for the future through decision making”, she says. “I have also completed the requirements to obtain my ALT last year but have been involved in the Regional Training Team as a tutor and session leader for a number of years”, Carmen adds. “I’m currently working on my Rover Service Bar so there’s a lot planned in my direct community”, she continues. Annually her Crew supports a hospice by donating profits from their coffee stand at the Christmas tree lighting ceremony in December. “We also volunteer in town by preparing food and offering our service to the 1st Port Scout Troop and Pack. 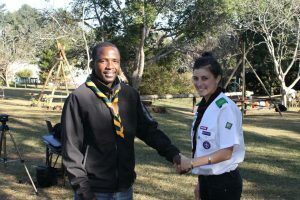 Koko, the Troop Scouter of 1st Port Natal does a great job and calls the Rovers from time to time to help with camps, planning, sourcing and funding. In every community with Rovers the moral and position of young adults is improved. It encourages a more integrated community”, she says. Rovering has also given her the chance to plan regional activities and to go overseas. 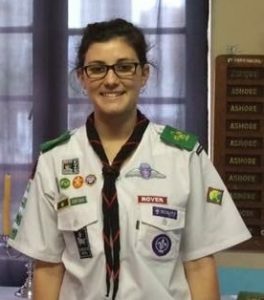 “I also had the amazing opportunity of representing Rovers in Iceland at the World Scout Moot 2017. It really was a once in a lifetime adventure, travelling to such a beautiful island that is so rich in its culture and has an amazing strive towards gender equality. It was great to learn how Rovers around the world are similar and different and how we can embrace and learn from each other”, Carmen tells us.